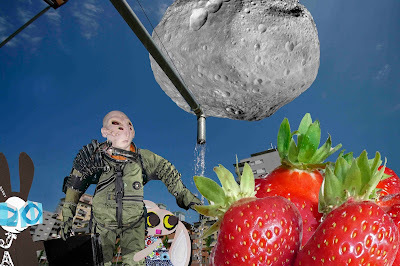 The Wabbit clapped his paws and everything changed. Strawberries gasped in amazement. The Wabbit held his paws high. "These," said the Wabbit; "are my mediating paws." "And this," said Lapinette; "is your mediator." She tapped the Alien Pilot's knee. He lifted his briefcase and spoke amiably. "I have various forms to complete - depending on your attitude." The Wabbit tapped the briefcase. "The mediator's judgment is final." Lapinette smiled sweetly. "And there's no right of appeal." The strawberries fell quiet, but one was forthright and shook his leaves. "What makes you the right mediator for us?" "I am alien and hence neutral," said the Pilot; "I'm partial to neither strawberries nor tomatoes." The strawberries looked up. "Is that your planet?" "No. It's my spaceship," said the Pilot. He pointed at it and it shook violently. The strawberries seemed alarmed but Lapinette waved her paws. "Any more questions?" she asked. A strawberry slid forward. "Alien Pilot - do you have fruit or vegetables on your planet?" The Pilot shook his head. "Only plants like seaweed and algae." "How do they get along?" asked a small strawberry. "Amicably enough now," said the Pilot. He smiled wryly. "Since the kelp massacres of '72." The strawberries went into a huddle then turned. "OK. If the tomatoes agree to mediation, then so do we." "Just one more thing," grinned the Wabbit; "and that's our fee ..."